It explores the colonial, geographical history of England and India taking an expansive and emotional time-travel, from the first Enclosure Act and the start of the East India Company in the 1600s, to 21st century narratives of trade, race and culture. Sue and Sheila activate insights into our shared past, laying out a ‘home museum’ of objects and stories; of the Great Hedge of India, of borders, and collections – all accompanied by original Shruti box laments. 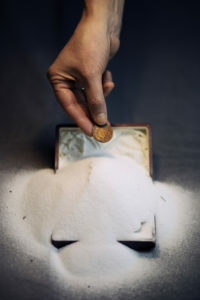 Common Salt is a reckoning; the interconnectedness between history and global power, artefact and trade, race and memory is hidden in plain sight’.